When EVA Airlines joined the Star Alliance fold earlier this year, the airline did more than gain new partners. As part of the airline alliance it meant a move to the newly opened Heathrow Terminal 2 from its long-standing London home at Terminal 3. A few weeks ago I joined a tour of Terminal 2, with EVA Airlines after their big move and discovered an airport revealing just how much flying is changing. Terminal 2 otherwise known as The Queen’s Terminal, was opened by the Queen herself in June this year. Since then, it has seen Star Alliance airlines such as Air Canada, Austrian Airlines, Air New Zealand, and now EVA Airlines taking up residence in their plush new home. 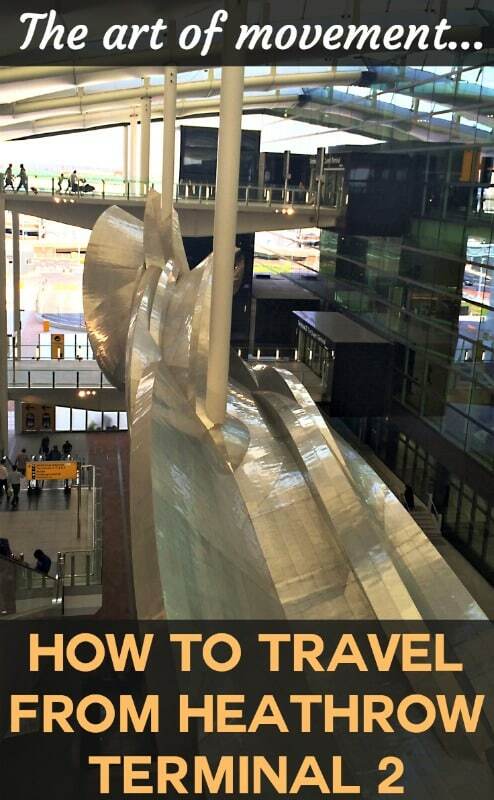 Terminal 2 simplifies the travel experience somehow. If you’re flying with Star Alliance airlines, this is the departure point for you. You no longer need to consult your ticket to see which terminal you’re at (well, maybe you should, just in case they change things in the future). It also means that these airline partners can share resources and facilities, which will surely make for a more streamlined and consistent service. 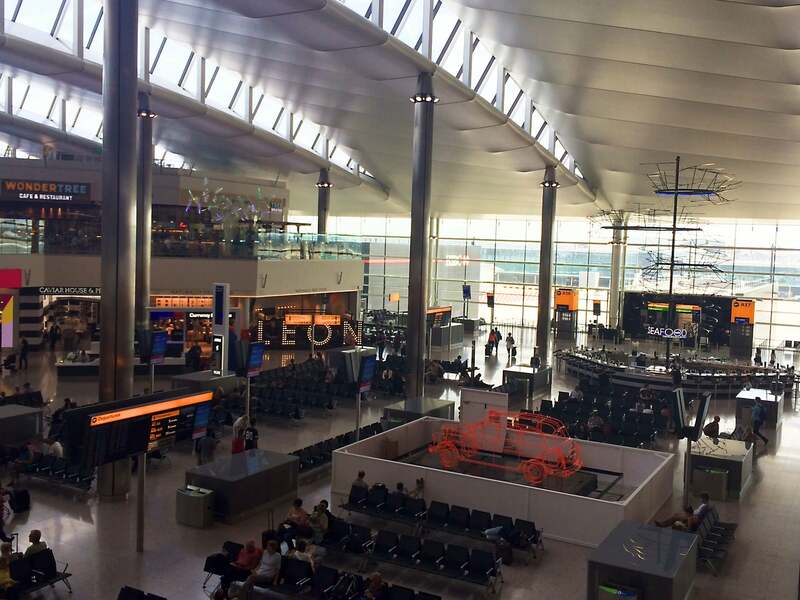 Heathrow Terminal 2 has many similarities with Terminal 5. Arriving at the airport you sweep into a surprisingly peaceful check in area with banks of self-serve check in desks. I’m always in two minds about this self-service phenomenon, as much as I appreciate the improvements technology can bring to our lives. I do feel a little that we’re loosing a layer of service as we’re expected to not just check ourselves in but our luggage too. What happens if we have queries that don’t fit into the automated check-in process? Still there is a friendly team of EVA Airlines staff on hand (for the foreseeable future at least) to assist with the check in process. Security is pretty much as you’d expect in an airport but there are more boarding pass scanners, further automating the process of getting you from check-in to gate. And the automation is completed with self-service departure gates – the first I’ve ever seen. Just scan your travel documents, board your flight and you’re away. But the airport’s new Terminal 2 is more than just a faceless, automated jungle where interacting with real people is a thing of the past. The Queen’s Terminal brings art, gourmet food and popular culture (well, if you can call shopping culture and impressed tax-free shopping fashionistas, will). The works begin in grand, public art form with the Slipstream. 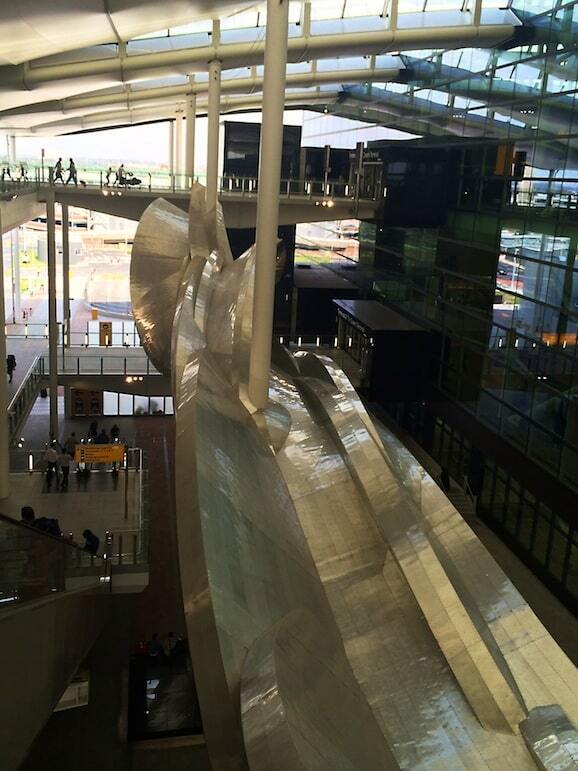 This giant piece, resembling the trails that follow aircraft across the skies when in flight welcomes people to the terminal. Airside, there’s London Taxi, by Benedict Radcliffe, highlighting the airport’s links to all forms of transport across London. 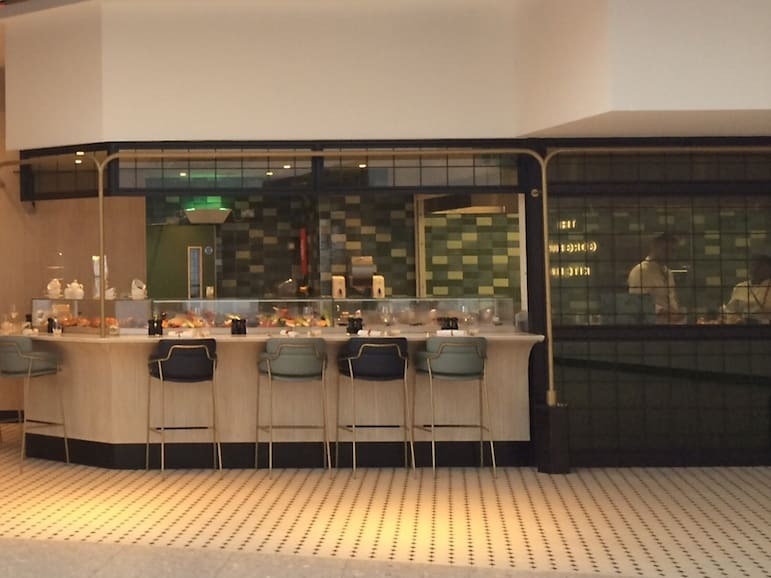 You won’t be short of creative meals either, with Heston Blumenthal’s The Perfectionists’ Café and the equally well regarded The Gorgeous Kitchen serving up a delightful menu made from locally-sourced ingredients. 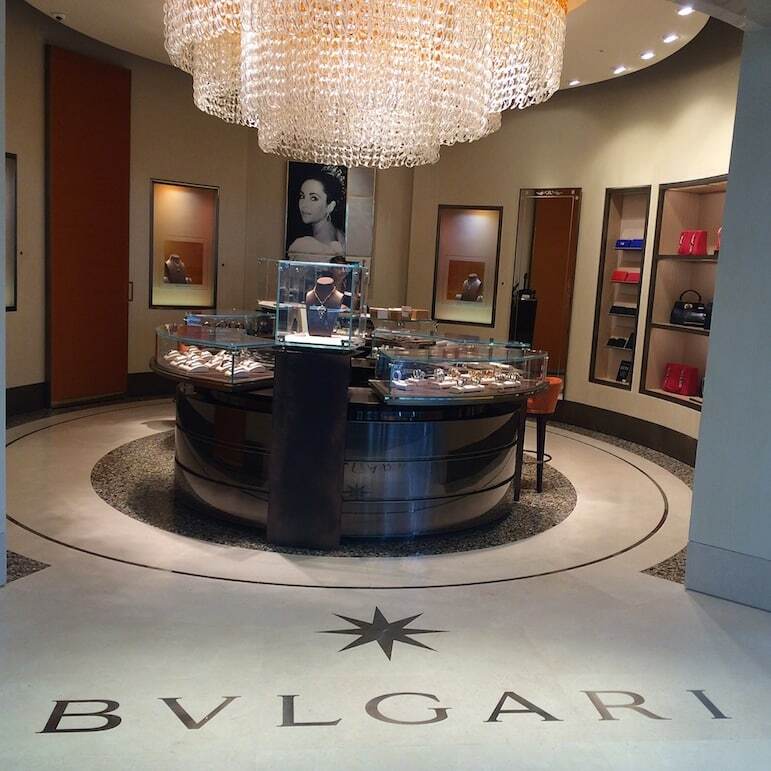 Shopping at Heathrow has become an event with designer names popping up all over Terminal 2, from Michael Kors, to Bulgari, Gucci and Mulberry. 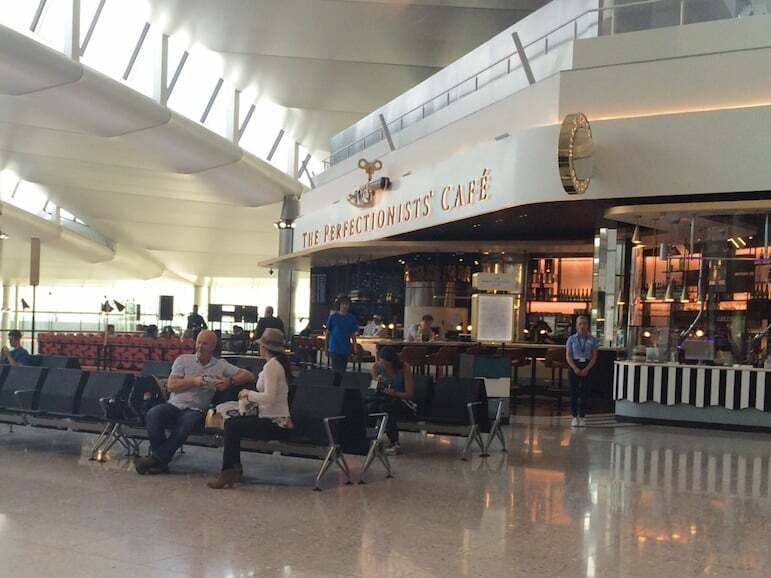 But there’s also a completely new phenomena – the world’s first branch of John Lewis in an airport – not bad for those looking for tax-free bargains. Moving into the Queen’s Terminal is perhaps fitting for EVA Airlines as their first class, or Royal Laurel passengers are set for a regal service. Sharing a lounge with Air Canada, means that EVA passengers, who depart on flights bound for Taipei, in Taiwan, via Bangkok, each evening, will have plenty of room to relax. There are no Air Canada flights in the evening so EVA’s premium passengers will have the space to themselves. And the service continues on board with a new menu of delicious meals for Royal Laurel passengers, prepared by Alpha Catering. All in all, the new Heathrow Terminal 2 and EVA Airlines experience are a boon for luxury travellers.